1/4 cup chopped fresh herbs or whatever fresh herbs you like, such as basil, flat leaf parsley, oregano, etc. In a medium size mixing bowl, toss together the artichokes, 2 tablespoons EVOO, garlic, herbs and some salt and pepper. Set aside. Arrange the bread slices on a baking sheet and brush lightly with the remaining tablespoon of EVOO. Pop the bread into the oven and toast until golden brown, about 5 minutes. Let cool. 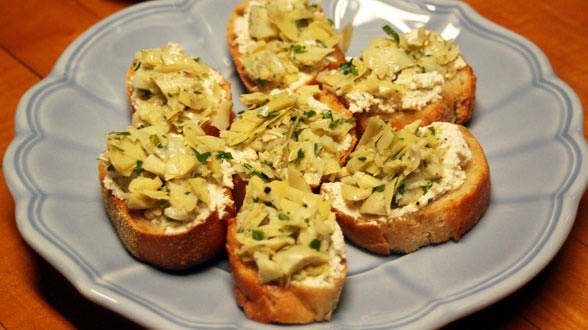 Spread some soft cheese over each slice of bread, top with a spoonful of the marinated artichokes and serve. In Recipes-list.com we have selected the most viewed recipes from category - uncategorized . Enjoy the best recipes specially selected for you! Baby Artichoke Crostini is the right choice that will satisfy all your claims.